While explaining why so many of you are workflow magicians, last month we looked at preflighting and the magic it brings to a workflow. This time the topic is web-to-print. Web-2-Print is not the answer to every print providers dreams. Setting up a web-to-print storefront is not a guarantee that you will find new customers, or that existing customers will use it. Standing up a web-to-print site does not guarantee new revenue streams. With all of that on the table, web-to-print can be a brilliant addition to a printing environment. The thing about web-to-print is that you need to know what you want before you start looking at possible solutions. Let’s look at some scenarios that workflow wizards have successfully implemented. In this scenario, a web-to-print solution is installed without an e-commerce component, but with a digital storefront that exposes a catalog of job options configured specifically for each customer. The web storefront might include an online design tool that enforces branding guidelines while ensuring that only agreed print formats can be created as a print job. The value to the customer is the ability to easily re-order paired to the option to create new products that will successfully print. Web-to-print to get new customers. For this option, the web-to-print solution usually has both a catalog of options, templates, and formats, and an e-commerce component that prices and takes payment. The caveat is that printers who install web-to-print solutions expecting that search engines will find them are generally disappointed. Successful printers who take this approach pair the installation of the solution with social and direct marketing campaigns that alert existing customers while reaching out to new customers. Another way to look at web-to-print solutions is as the job-onboarding solutions that normalize all the specification capture for each job. It might have an e-commerce and pricing engine, just a pricing engine, or simply capture specifications for follow-up by a sales team member or CSR. In any of these scenarios, the value of the web-to-print solution is that it creates a streamlined way to accept files in and ensure that all the required information is captured. It reduces the amount of time spent by CSRs following up on orders and creates a standardized set of specifications to pass to the production team. It’s a good question because there are so many options. Start by talking to your hardware and software vendors to see what they have to offer. Then broaden your search by attending Print18 in Chicago, where there will be many options in the Exhibit Hall and many educational sessions to help you make some choices! If you have stories to share, reach out to me! @PatMcGrewon Twitter, on LinkedIn, or Pat.McGrew@KeypointIntelligence.com all reach me. Pat McGrew is the Senior Director and Evangelist for the Production Software and Services team at KeyPoint Intelligence / InfoTrends. As an analyst and industry educator, Pat works with InfoTrends customers and their clients to promote communication effectiveness and best practices. 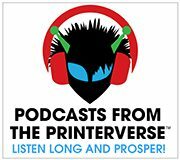 Her experience spans all customer communication channels, plus transaction print, data-driven, and production commercial print using offset, inkjet, and toner. Co-author of 8 industry books, editor of A Guide to the Electronic Document Body of Knowledge, and regular writer in the industry trade press, Pat won the 2014 #GirlsWhoPrint Girlie Award for dedication to education and communication in the industry, and the 2016 Brian Platte Lifetime Achievement Award from Xplor International. Thanks for this article, Pat! I do want to point out that we, RedTie, will not be at Print18. We are a low cost but feature rich web to print software, and as such, we limit the money we spend on shows. We rather keep our prices down! There are many other ways to find web to print providers besides shows. Check with your MIS provider, your list provider, and/or do the research online.